← MMT: The antidote to nonsensical economics. Conventional wisdom, and many politicians, would tell us that it is. Before we accept that to be true, we might just want to first consider the relationship between all forms of debt, and credit, in the UK national economy. As I have ties to both the UK and Australia I’ll be British for the purposes of this post. Our currency is no longer backed by gold or anything tangible. If we look at a £5 note we see we “promise to pay the bearer on demand the sum of £5”. It is really quite a meaningless commitment. The pound, like all modern currencies, is nothing more than an IOU issued by government. If the government did not issue their IOUs, they would not have their debt but neither would any one of us have any currency in our wallets or bank accounts. We wouldn’t have any credit. In other words, government debt, or national debt, is simply the mirror image of non-government credit. If one account is negative the other has to be equally positive. It cannot be anything else as all accountants who know the principles of good bookkeeping will know. Non- government credit can be divided between UK owners and overseas owners. The latter may have accumulated credit by simply selling us all sorts of goods and services and later keeping their money in £ deposits in banks which ultimately end up held mainly as UK government securities. It is just another form of bank account. What else can they do with their money? If the owners of these bank accounts wish to make a withdrawal at any time they are of course free to do so. UK holders can keep their credits in their bank and building society accounts, government bonds, and even their piggy banks! They too can make a withdrawal and spend it at any time. We should all be careful when extending what we all know to be true at the microeconomic level to the macroeconomic level. The common analogy that a government is like a household and has to live within its means is obviously flawed. It is a fallacy of composition. There are not many households which have a currency printing press in their basement and have computers which can credit their bank accounts at will! The government is the issuer of the currency and everyone else is a user. That makes all the difference. Users can lend government IOUs to each other; but, governments cannot borrow back their own IOUs any more than an individual person can borrow back their own IOUs from their holders. (You might want to think about that for a moment) It would be just the same as writing out another one. It is reasonable to question if the term ‘borrowing’ is really applicable. As a nation the UK is richer than at any time in its history and yet in general, the population worry over much about the size of the so-called National debt. Many think we are on the verge of bankruptcy. Nothing could be further from the truth. The UK can never involuntarily default on any debt denominated in the national sovereign currency. Government cheques will never have to bounce. They can always be honoured. That is not to say that Governments can write cheques without limit. That is not to say the size of any deficit between taxation and spending can be totally ignored. Inflation can of course be a problem. If there is too much spending or if tax collection is inadequate prices will rise and no-one with any economic knowledge would attempt to deny that. Neither is it to say that there are no economic problems for the UK to face. There are and will increasingly be problems of energy scarcity for example. There will always be a measure of disagreement between those who would argue that inflation should be secondary to unemployment levels and those who would favour an ultra low inflation rate. There is also a question of how resources should be shared. Economics cannot settle all political arguments. It can answer the question of where the money is going to come from though. If you have followed the argument so far you should be able to answer that question yourself and, if so, you are far ahead of most politicians in understanding how our economy really works. This entry was posted in MMT General and tagged MMT, National Debt. Bookmark the permalink. 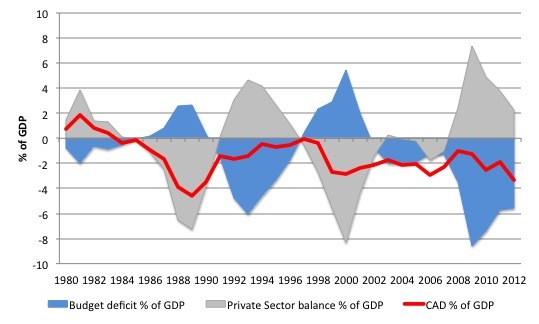 Can you link to the data you used for the sectoral balances chart? Thanks!